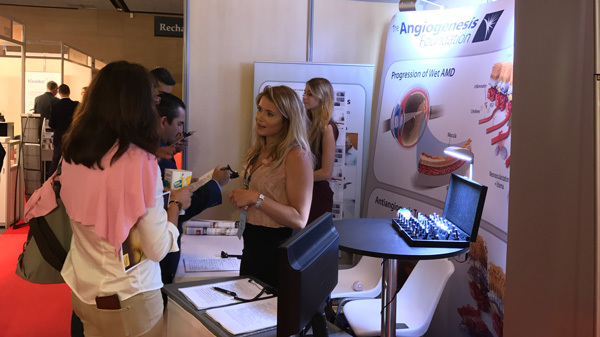 The Angiogenesis Foundation attended the 17th Euretina Congress in Barcelona, Spain, to raise awareness of retinal diseases impacted by angiogenesis. This year, the Foundation’s primary focus was to raise awareness and improve understanding of geographic atrophy (GA), the advanced atrophic form of age-related macular degeneration (AMD). Currently, there is no approved treatment for GA, which is a huge contributor to AMD-related blindness worldwide. However, several therapies are currently being investigated in clinical trials. In addition to GA, the Foundation has a robust patient advocacy focus in neovascular AMD, diabetic retinopathy (DR), and diabetic macular edema (DME) because these diseases are highly treatable with anti-VEGF therapies, which inhibit angiogenesis in the eye. These serious retinal diseases affect millions around the world and lead to vision impairment and even blindness. During the Congress, the Foundation debuted its Geographic Atrophy (GA) Multimedia Educational Toolkit, which includes 3D medical visualizations of GA’s pathobiology and potential therapeutic targets. The Foundation’s team also distributed 1,755 copies of its geographic atrophy educational materials in print and digital formats. Additionally, its team collected extensive international survey data from more than 600 leading retina specialists and advocates to help improve real world outcomes for patients across retinal diseases. To learn more about the Foundation’s work in GA advocacy, please visit geographicatrophy.org.